Fujica GL690 professional is a 6x9cm format camera launched at the same time as Fujica GM670. 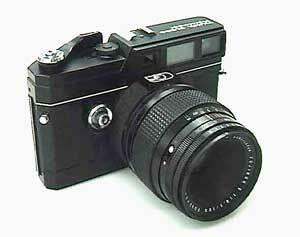 Like Fujica GM670, Fujica GL690 professional was introduced as the minor change version of Fujica G690 BL. The shutter button was added on front of the camera body other than on top of the film wind lever, and also several improvements were made in detail such as that R (Roll film) - S (Sheet film) selecting switch was added on. First introduced in January, 1974.